Amongst the well known Freedom Fighters of the Majha area features the name of Shaheed Bhai Surinder Singh aka Shinda Galowal. Bhai Sahib was born in the village of Kotli Sainian, District Gurdaspur on December 9, 1964. After studying till 10th grade at the state high school of Hargobindpur, Bhai Sahib went on to complete an ITI Mechanical trade course at Kaadian. Upon completion of his course Bhai Surinder Singh began helping his family by farming their ancestral land. During these times the Sikh Freedom movement was at its peak, the movement was widely supported by the masses and villagers gladly fed and provided refuge for the Jujharoos. Bhai Surinder Singh’s home was often visited by Jujharoo Singh’s passing through his village and as a result Bhai Sahib and his family were regularly subjected to police harassment and abuse. Bhai Surinder Singh left his village and began to learn Santhiya (correct pronunciation of Gurbani) from Damdami Taksal at Gurdwara Gurdarshan Parkash (Mehta Chowk). Here after completing his Santhiya began to partake in sewa of Langar and Amrit Sanchar’s. During this time Bhai Sahib came in contact with many great Jujharoos and became particularly close to Shaheed Bhai Jugraj Singh ‘Toofan’. Following Bhai Jugraj Singh’s Shaheedi Bhai Surinder Singh was requested to join the armed movement by the companions of Bhai Jugraj Singh. In this manner Bhai Surinder Singh was recruited and became and active member of the Khalistan Liberation Force. Bhai Sahib’s first course of action was to force the police to surrender the weapons which were seized at the time of the Bhai Jugraj Singh and Bhai Bakshish Singh‘s encounter. Bhai Surinder Singh went to work closely with Bhai Tasbeer Singh Jhander, Bhai Sukhwinder Singh Aulakh, Bhai Surjan Singh Tibar, Bhai Amarjeet Singh and Bhai Kuldeep Singh Fauji. Bhai Sahib was highly respected by all Jujharoo Jathebandi’s and due to his humbleness, resolute faith in Akaal Purakh and orthodox character he won the respect of the local villagers. As time passed and Bhai Sahib’s fame began to grow a bounty of 10 Lakh (1,000,000) Rupee’s was placed on his head. Bhai Surinder Singh was a humble Gursikh and always travelled on a bicycle. On one occasion a police informant spotted Bhai Sahib and had him captured at the village of Hameera, near Dialpur. Bhai Sahib was taken to the infamous Beeko Interrogation Centre in Batala, where he was tortured immensely. However Bhai Sahib did not speak a word as to the whereabouts of his fellow Singhs or disclose any information on the Jathebandi. 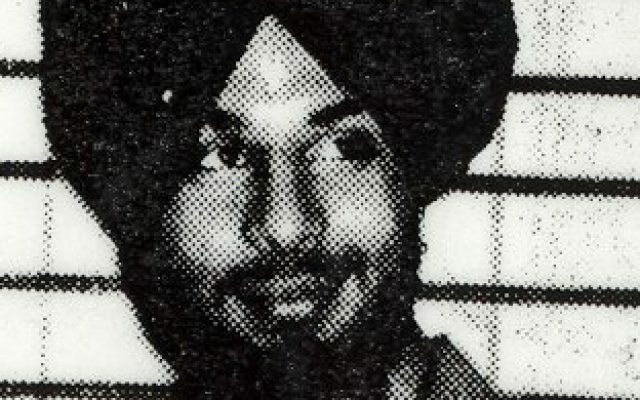 Bhai Surinder Singh eventually tortured to death. Bhai Sahib attained Shaheedi on 22nd May 1993.